By combining several different capabilities into a single app, Writing Kit blurs the line between uni- and multi-tasking. One of the core features and frustrations of Apple’s iPad experience is that you can only use one app at a time. Joanne McNeil once lauded the iPad’s lack of multi-tasking, saying that it was a focus machine. “It’s putting a constraint on me … and my worst multi-tabbing, unfocused habits.” iOS 4 has since introduced multi-tasking, but that’s in the form of allowing apps to stay resident in memory. You can still only look at one thing at a time. This can be a real benefit, but it gets problematic if you are working on a single task that requires more than one tool. Enter Writing Kit by developer Anh Quang Do. 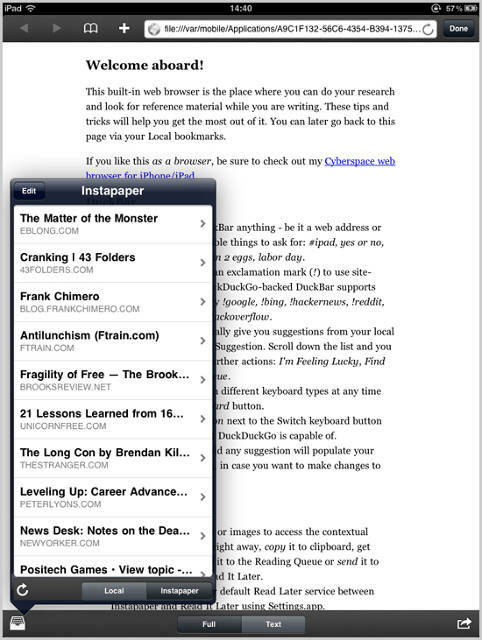 Most iPad writing apps like WriteRoom, iA Writer or Daedalus Touch focus on doing one thing well. Often their big selling point is that they are a “distraction-free writing environment,” meaning the only thing you can really do on them is type text into a file. If you write like I do–which is to say: in a constant flow between checking notes, looking things up and typing–none of these work for completing drafts. Writing Kit’s approach is to make an app that combines a disparate set of capabilities into a single product. There’s a built-in browser and scratch pad for research and notes. 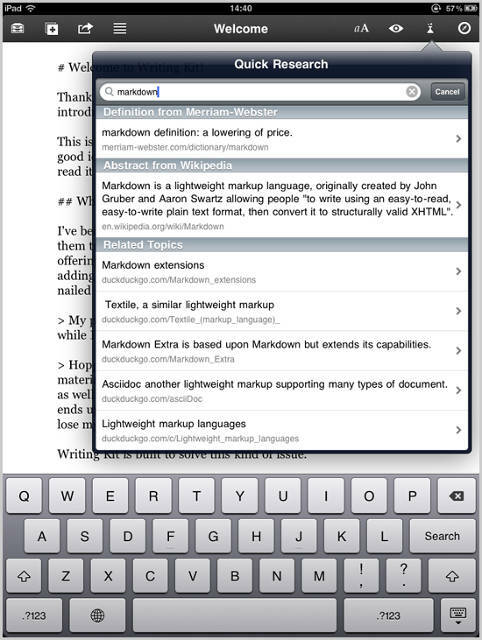 It uses Markdown (with custom toolbars and a previewer to help editing). It integrates with Dropbox and TextExpander (Quang Do calls these “the ‘standard requirements’ of new writing apps”) along with a who’s who of services beloved by a certain kind of writer (Delicious, Pinboard, OmniFocus, Instapaper, to name a few). It’s app as multitool, seeking to provide all the functions that a web-native author might want in their day-to-day work. What I find interesting about it is the way of thinking about how you carve the world up into tasks. From an engineering standpoint, it’s kind of a mess of features. From a user experience design standpoint, it’s a tuned set of tools for a particular kind of user working on a particular kind of job. This style of integration makes no sense on a machine that allows you to open two windows next to each other, but becomes very interesting on a machine where you can’t. Equally interesting is Writing Kit’s place in the app ecosystem. It relies on a constellation of popular niche applications which provide their own public APIs and store their data somewhere shareable. Many of them are excellent standalone apps. What Writing Kit brings to the table is the way that it weaves them together. Like a multitool, many of Writing Kit’s pieces are only good enough, but together, they offer something greater than the sum of the parts. Many tools are combined for a single purpose. You could easily imagine a different app aimed at a different kind of creative, that wove together a slightly different set of services in a significantly different way.